I admit, I haven't read Pearce's other books. I intend to pick up Sisters Red before this one comes out, as it's supposed to be a companion novel. I enjoy fairy re-tellings and based on her videos, Pearce seems like an intelligent and witty person, so I have high hopes for these books. Also, it took me about two weeks to realize that there's a face on this cover. Sad, right? Oh I want to read this one too! Jackson Pearce is awesome. Loved Sisters Red - and cannot wait for Sweetly! Whoa, nice choice. 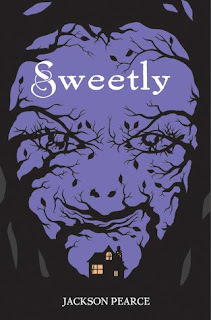 Creepy cover (that face in the trees is a doozy) and the synopsis sounds very interesting. Adding to me "watch for" list. Thanks for sharing! OMG, that is so cool about the cover. I loved it already, but now I love it more. I still have to read Sisters Red. This cover totally gives me the creeps. I cannot lie. And I haven't read a book by Pearce either, but so many people have raved about her books that I feel like it's a crime not to.